I loved the texture of this Elephants skin with the wrinkles and the mud. Congrats on this shot taking top honors at the fair Laura! So before the challenge I was trying to think of something that would be considered "greyscale" and couldnt really come up with anything. Well you have one here and its a great shot to boot. My only complaint ( a small one at that) is the left eye - either all in or all out IMO. Hope this scores well for you. Back to bump - you get one more point from me - good luck tonight! It ain't no bird but it is a wonderful photograph. I'd love to see the rest of the photos you took of this magnificent animal. Nice composition with good lighting. My favorite so far. Pushing the black and white rule a bit perhaps, but I just love the texture and the framing. I am so envious that you had the opportunity to take this photo, I really want to see a real, live elephant for myself one day. This is gorgeous, and I love the emotion captured as well as the texture. Adding to my favorites, good luck with the challenge! Just an over all fantastic shot. Nice shot, but it doesn't really go with the theme of this competition. Great shot! Portrays a beautiful picture! Wonderful picture. I wish he was a little more grey though, he is a bit on the brown side to me.. I love the detail though. Wonderful picture and great idea! 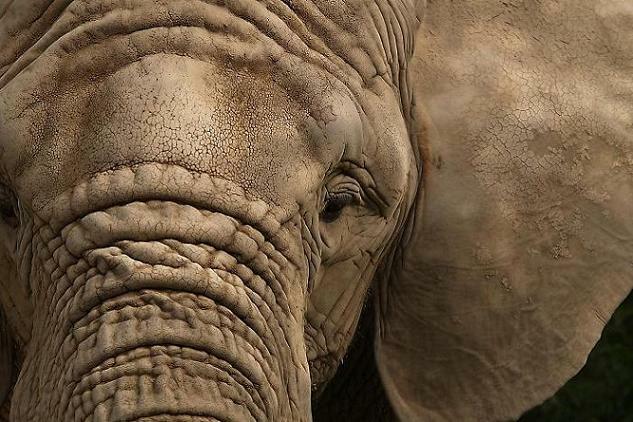 awesome detail on the skin of the elephant! nicely done! Nice detail. Great use of white balance to make it appear sepia toned. Looks more sepia than B&W but still in my top 10. The cropping of this image is perfect and I've added this to my favorites. Love the detail here! Tack sharp focus ! I'm not seeing the black or white. I do love his trunk and ear though. Proudly hosted by Sargasso Networks. Current Server Time: 04/22/2019 04:51:33 PM EDT.